Personally I never expected too much from BaoFeng UV 5R plus. Baofeng UV 5R plus is the evolution done in 2014 of the BaoFeng UV 5R first edition and I was thinking it will be not a surprise. But I was wrong. BaoFengUV-5R+ Dual-Band 136-174/400-480 MHz FM Ham Two-Way Radio, simple as this. Baofeng UV 5R plus had many in-depth revisited features. That is good because the first edition was a weak compared to this one. Baofeng UV 5R plus is an upgraded high-tech product able to offer the maximum convenience for yor hamradio activity! This Baofeng walkie talkie radio is characterized by its long standby-time (battery was upgraded), long-distance communication, full Baofeng accessories set, excellent sound quality and clearness. The producer implemneted highly advanced technology based on high quality material. This model has nothing to compare with the previous model of Baofeng walkie talkie. It is great in durability and reliability, especially during emergency operations. It boasts anti-shock, anti-drop and rain-proof advantages. Easily receiving signal and sending out as clear information as possible, this BaoFeng 5R+ Plus was upgraded with an Ultra-Clear Dual-band Long Distance Walkie Talkie will make you astonished for its quality! Upgrade the frame material. Metallic, more durable and more fashionable. With full high two colors LED definition display, the screen exquisite clarity. The new English, German, French instruction, more convenient and more humanized. The New 2013 packing, more beautiful and quite well-done. Shipping Return & Warranty Payment Rely are in charge of Amazon. This is way is better to purchase the BaoFeng UV 5R plus from Amazon. I suggest you to purchase as soon as possible a better antenna for yout BaoFeng UV 5R Plus. When buying a better and brand new antenna, make sure you get one that has a FEMALE SMA connector. If you are familiar with Kenwood RTX you have an experience with MALE SMA, remember that an antenna with such a connector will not work. The antenna I personally suggest is the ExpertPower® 14.5″ DUAL BAND 144/430Mhz U/V SMA-F Antenna For BAOFENG UV-5R WOUXUN KG-UVD1P. I purchased mine from Amazon, and am very pleased with its performance. This antenna improved range, both transmit and receive by a 50% at least. You MUST purchase a programming cable equipped with the FTDI Chipset in its USB adapter. Other knock off chipsets do not use good (and MicroSoft Certified) drivers and may or may not work or work erratically. The cable is very useful and it needs a driver to work and the FTDI chipset is supported by MicroSoft, with no other to install, it will take its place automatically when you plug the cable into a USB port on a Windows computer. I tested the cable purchased on Amazon and it works with Win7 64 bit just fine. The 3rd suggestion I want to highlight to you is: forget the programming software from BaoFeng. Download CHIRP (that is a free software to programm your Baofeng UV 5R plus) and use this software. The BaoFeng software is a pain an the CHIRP is far away better and quite intuitive at the usage. I love the sharp and clear display, equipped with backlit color changes for what is taking place (squelch open, transmit, etc.) Also has a bright green light (LED) that illuminates when a signal is being received (squelch open). I really appreciate the great feel in the hand, especially the brand new battery 3800 maH Li-Ion with an extended battery life. Audio is good enough and the keypad is extremely solid. The RX function is excellent in quality and reliability. Noisy environments with elevated QRM and QRN might be problematic. Even with the included antenna i had good performances, but with the new one I become surprised about the efficiency of this cheap radio. The charging cradle is solid and very well produced, with LED feedback on “waiting, but powered”, “charging” and “fully charged”. Nicely done and the slots in the cradle line up properly with a battery to be charged, so you can’t put another not compatible battery in the cradle. I do not appreciate the way to get off the battery, because battery removal is difficult. Even the antenna connector is just the opposite of most ham radio handi-talkies. It should be an SMA FEMALE on the radio, and of course, it is an SMA male, so existing antennas that one might have won’t work without an adapter, if such a thing even exists. I don’t like to be forced to purchase a new antenna if I want to increase the performance of my BaoFeng UV 5R Plus. For a small amount of money the BaoFeng UV 5R Plus is an amazing radio, to be sure. Rx and Tx performance are excellent, sensitivity is ok, squelch is clean and crisp, audio both TX and RXare great, if a bit “thin” on the transmit side. Amcrest Direct (Amcrest Industries) is the authorized US Baofeng exclusive distributor of the UV5RV2GREEN. Amcrest offers US based warranty service out of our office in Houston, TX, (no shipping to China). You must ensure that Amcrest Direct (FirstVision) is your selected buying option to claim the US warranty. Frequency Range: 145-155 / 400-479.995 MHz. Metallic upgraded, durable housing. English user manual included. Upgraded 2018 Bright & easy to read two-color LED display. Compatible with UV-5R 3800mah and 3600mah Extended Batteries. The second reason is that Amazon loves to delights the customers. Amazon is a store where the consumer is always treated with gloves: whatever happens to the goods you will always have a person on the other hand able to help you with professionalism and courtesy. 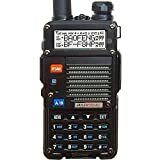 Amazon will never abandon you in the midst of a problem and you will always find a solution if your Baofeng UV 5R plus is arrived damaged or if you made a mistake ordering something. Delivery is punctual, tracked and you can ship the Baofeng at home, office or mail box. We do not know you, but we are always at work and we always are not at home to receive the goods. The convenience of getting the goods where you want is undoubtedly one of the greatest support Amazon has to offer to you. And what if things really go wrong? Should I find out that you bought the wrong radio or the wrong accessories for your Baofeng UV 5R Plus? Amazon warrants free refund for any reason, within 30 days. You can return the Baofeng UV 5R Plus you have mistakenly purchased without having to give any explanation. You will not have to justify it for any reason. 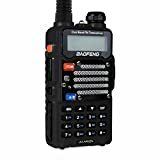 Finally, Amazon offers the free shipping: if you spend more than few dollars, and with the Baofeng UV 5R+ plus few accessories you will have zero problems. In fact you amateur radio surely costs more than this limit unless you just take one of those terrific deals you can not say no. But in that case, saving would be anyway.